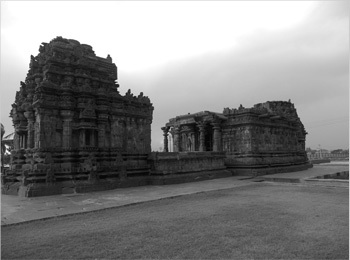 The Kasivisvesvara Temple is a Shiva temple located in the village of Lakkundi in the Gadag region of Karnataka. Located about 400 odd km from Bangalore, this nondescript place lies along the route from Hubli to the historical town of Hampi and is easily accessible through the series of highly networked roads. 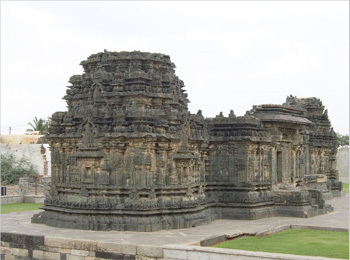 Lakkundi was the center of the Western Chalukya Architecture at its zenith and hence is home to more than 50 ancient temples scattered across the region. However of all the temples, the Kasivisvesvara temple is often regarded as the most intricate and stunning example of Chalukya architecture. Although primarily a Shiva Temple, the sun god Surya also occupies prominence here. While God Shiva is depicted in his universal form of a Linga, Surya personifies magnificence atop a throne drawn by seven steeds. In this form he is addressed as Suryanarayana. The shrines of Shiva and Surya face each other with Shiva facing east and Surya facing west. This is an unusual arrangement as Surya usually faces East and has hence gained significance among historians. The temple is said to date all the way back to the 11th century. The temple is famous for its intricate carvings and decorations and is regarded as a testament of the Chalukya rulersa fascination with architecture. Elaborately decorated pillars and exquisite stone chiseling on the window slabs are just some examples of Chalukya craftsmanship that mesmerize archeologists and casual historians alike. Closer inspections of the wall carvings and the relatively simple construction of the temple’s main mantapa indicates the temple beginnings were relatively demure and the intricate architecture were most likely added on during the later days of the Chola invasions of the Chalukyas. The overall architecture of the temple borrows heavily from architectural influences from Northern India. Decorative moldings adorn the southern and eastern doorways. Images of Gajalakshmi accompanied by an elephant are carved onto a lintel’s block. The outer walls consists several niches topped off by a decorative tower immediately followed by an arch. This pattern repeats itself along the entirety of the shrines superstructure. The pillars and shafts have evidence of high polishing, which are a testament to the skills and craftsmanship of the artisans of the era. The Gadag Railway Station is just 13 km away from Lakkundi. 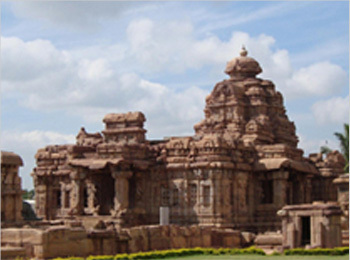 The best time to visit this temple is during the annual Lakkundi Utsav, a festival of arts held in May every year.